Technokrats was established on the year of 2010. We are a leading Service Provider of Steel Industrial Chimneys Structural Engineering Service, Long Span Shed Structural Design Services, Bunkers Structural Design Services, Pipe Conveyors Structural Design Services, Power Boilers Fabrication Drawing Service, etc. Technokrats is Pune based company with highly experienced personnel in structural field focusing on structures related to Material Handling Plants for thermal power stations and Mobile Machines like Stackers / Reclaimers, Boilers, Sugar plants & Cement Plants, With reference to power plants I was responsible for complete design and detail engineering of Structures; a) Related to Coal Handling Plants of capacities varying from 1100 to 2800MTPH for Thermal Power Plants. 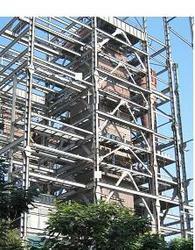 b) For Boilers of capacities ranging 100 to 250 TPH, Top Hung Boilers of Structural weights of 700 t to 1500 t.